To feed Bones or not feed Bones, that is the question! The Pack has gnawed on hundreds (and probably thousands) of Bones over the years. 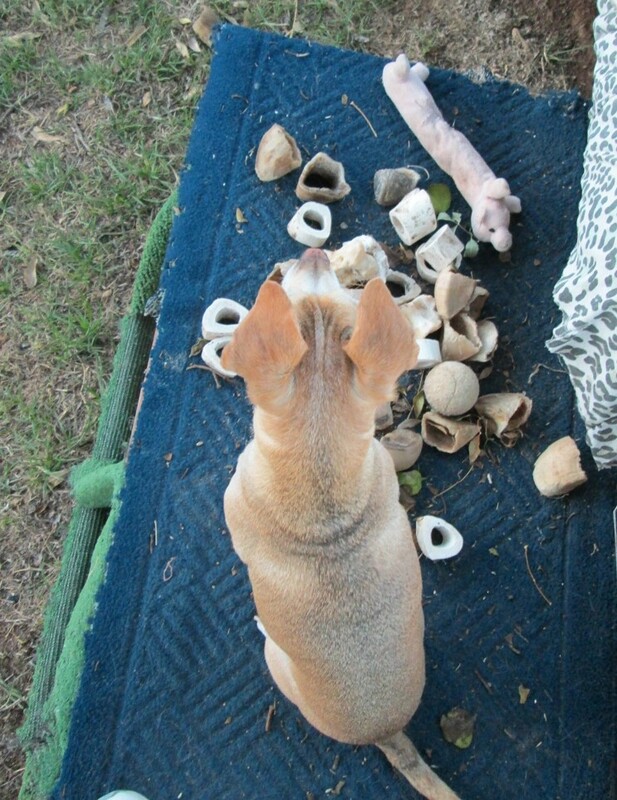 One time I went out and collected over 265 Bones from the yard (and then made landscape art with them). Time and again I have witnessed the enjoyment and satisfaction Pups derive from chewing real Bones and I feel that the benefits far outweigh any risks. When Pups are given fresh, new Bones, their People need to stay close and monitor the chewing. As well as making fetching jewelry, marrow Bones can get caught around bottom jaws; I’ve removed several over the years. Bones with lots of ‘joints’ in them can separate into smaller pieces–Rrrroscoe once had one of those pieces impaled on a back tooth and couldn’t paw it loose. He realized he was having difficulty and fortunately by then liked me enough to let me help. Another time Sedona, a Greyhound, managed to get the flat Bone she had been systematically devouring stuck in the roof of her mouth. With a row of pointy teeth on either side, the Bone was the perfect size to wedge right in there. The odd way she was using her tongue and pawing at her mouth alerted me to the problem. Thankfully Sedona allowed me to stick a digit in her mouth and pry the piece from her palate—it was not an easy task. Pay Attention! As Bones become reduced in size, be ready to trade a biscuit for any sharp, small pieces that could potentially cause harm. And remember, like anything else, too much is too much. 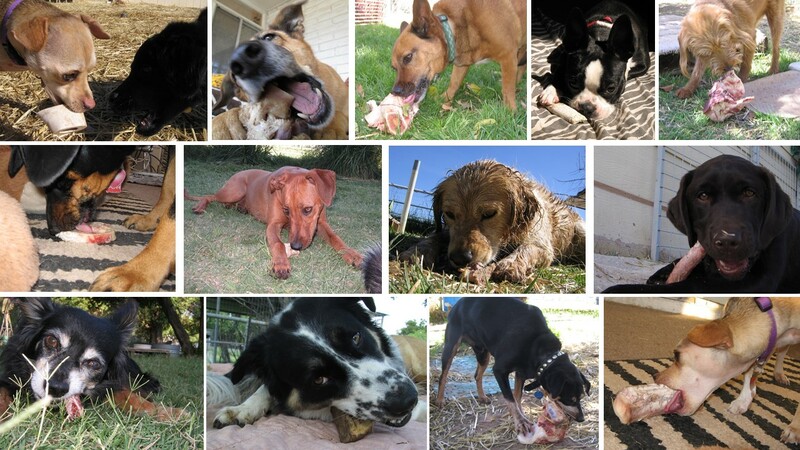 Domesticated Dogs shouldn’t be allowed to devour Bones the size of their heads in one session–doing so can overtax the body’s processes and organs and make the Pups quite ill.
Hooves are also a favorite! 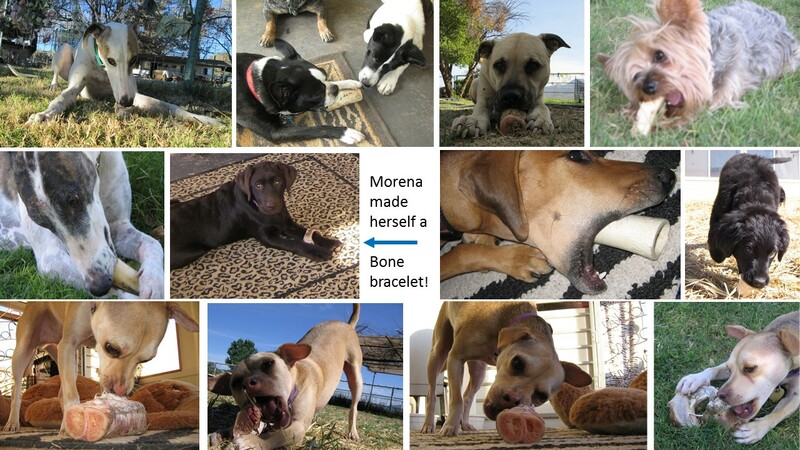 If you live in Arizona or Colorado, Suzie’s Doggy Delights has the most awesome hooves for sale! I am not a big fan of chicken necks, chicken feet, or turkey necks for Dogs. The experiences with these three items have not been pleasant. Please do not leave your chewing Pups unattended.